Updated fire place, hall and master bath. Gutted bathrooms to update for an elegant and luxurious feel. 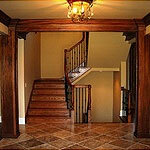 For this home we added red mahogany to give a rich and warm feel. 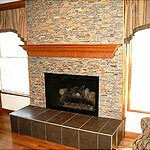 Trim work as well as updated mantels helped achieve the modern feel. 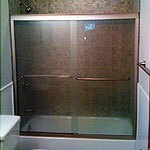 For this project we demolished existing bathroom and gave it a modern feel. We added chair rail, wains coating, pedestal sink, glass sliding doors, ceramic and glass tile. 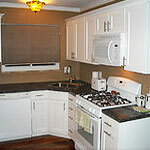 For this kitchen, the customer wanted to have clean lines with a decortive element. They picked a black flat top stove that blended with the counter top for the sleek look and matched the inset microwave. For extra space, they wanted an island and finished off the room with a wall that included inset shelves. 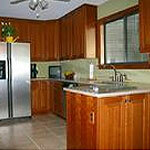 In this gallery we updated a couple of kitchens. We added all new cabinets, counter tops, and flooring. 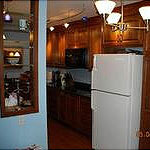 In this gallery you will see how the kitchen had to be gutted and remodeled from the ground up. 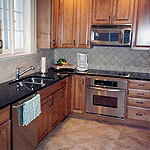 We installed new cabinets, sink, custom counter top, added a dishwasher,and a slate back splash. 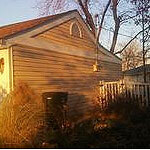 In this gallery we have installed new vinyl siding, soffit, fascia and guttering. 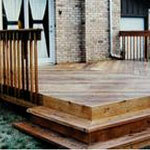 In this gallery we wanted to show a wide range of different patios and decks that we have added on to houses over the years. For the kitchen update we took the preexisting cabinets out and installed new custom cabinets. We used a solid surface counter top with a under mount sink to give it a clean and sleek look. 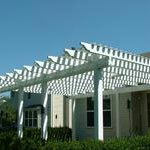 Customer wanted to give a little bit of shade and a great design element to their back yard for entertaining. With this project we reinforced the concrete slab, set the pillars in concrete and used a vinyl material for the structure itself. 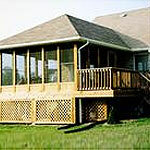 For this project we added a enclosed porch to an existing house. To give it a unique element we gave it a vaulted ceiling and a screened it in for all year round use. We closed in the underneath for storage and to give it a clean look.